How many times have you stood ashore, gazing longingly at a boat departing from Cape Town harbour, or a massive ship that appears tiny as it cruises away on the ocean to a distant destination? Who’s concerned about its destination? Nevertheless, it’s an experience that evokes wanderlust and tugs insistently at your very being. You want to sail away to somewhere, anywhere. Who cares where you end up, as long as you obey this romantic longing for cruising to equally romantic distant lands? “The owl and the pussycat” boarded “a pea green boat and sailed away for a year and a day, to the land where the Bong tree grows”, according to the favourite children’s rhyme which tells the tale of these two unlikely partners and their sweet love. While we cannot lay claim to having any Bong trees in the Cape, we have a lot more to offer residents and visitors to our fairest Cape. 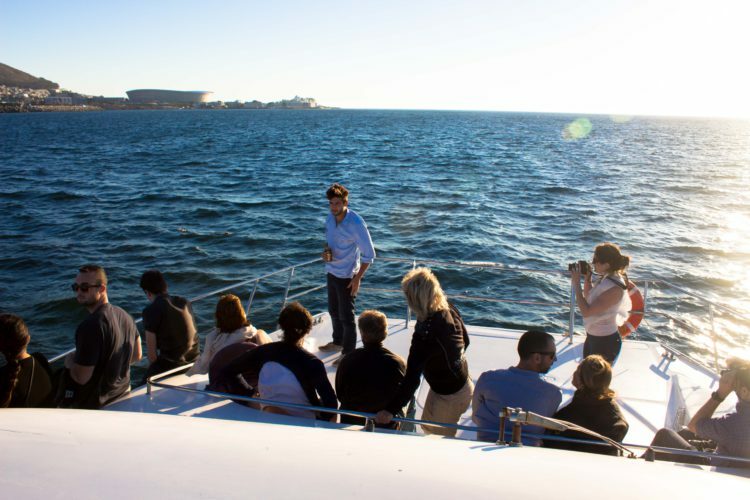 This includes luxury boat cruises, departing from the wonderful V & A Waterfront, cruising to Clifton’s famous 4th Beach and back again. We are known as Tigger 2, and we offer charter boat cruises on our 55-foot luxury power catamaran. The Tigger 2 Royale is white in colour, proudly displaying its sleek design lines against the contrasting backdrop of the blue ocean and the vast African sky, where it meets the sea on the horizon. Tigger 2 Royale’s power is supplied by two 530-hp turbocharged diesel engines, mounted discreetly inboard, thus minimising discernible engine noise and maximising the passenger experience of being out on the ocean. Our luxury boat cruises at about 12-16 knots, but is capable of reaching speeds of up to 22 knots, so there’s power aplenty, plus some to spare, all in the interests of our passengers’ on-board comfort and safety. Additional on-board safety equipment includes life jackets with lights for all passengers and a life raft that accommodates up to 65 people, all in compliance with the South African Maritime Authority’s safety standards. The Tigger 2 Royale is also fitted with a smoke alarm and sprinkler system, to further protect our passengers. We consider the Tigger 2 Royale to be the flagship of the charter industry in the Cape. Once aboard, you will immediately see why this is so. There’s a seamless flow from the streamlined exterior to the clean, immaculate lines and tasteful, elegant white leather furnishings and appointments of the boat’s interior spaces. For our passengers’ enjoyment, Tigger 2 Royale features an open sundeck at the front of the boat, and another on the rear deck with an overhead cover to protect and shade those who prefer to stay out of the sun. In addition to our plush furnishings, the interior of Tigger 2 Royale is something to behold. Inviting, comfy lounge couches are fitted to gently follow the curves of the vessel. A scattering of white ottomans adds to the luxury of our stylish boat. This intimate yet specious area is equipped with ladies’ and gents’ restroom facilities, a DVD player, and a 42” plasma screen that features DStv channels. A PC connection is also on hand for on-board presentations. Irrespective of which Cape cruise option you choose, our standards and service levels on the Tigger 2 Royale are impeccable. Like you, the owl and the pussycat would have been in 7th heaven aboard our luxury cruise boat. If the intrepid pair had heard of Tigger 2 Royale and our stunning selection of cruises when they set off in their pea green boat, they’d have skipped the land of the Bong tree and set course for the fairest Cape, at once. Our Cape cruises are a “must” for you too.